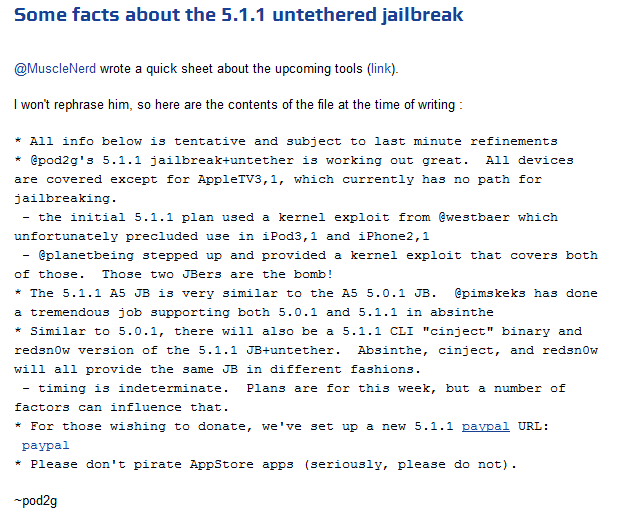 I receive lots of questions either by email or twitter about the 5.1.x untethered jailbreak. The poll about releasing now or waiting for 6.0 ended with a 64% / 33% to release ASAP. Where is the link ? ETA ? How much % done ? etc. As I said earlier in twitter, there's still a lot to do to have a user friendly and well tested tool to install the jailbreak on end users devices. Expect a release in a couple of weeks. Will it be compatible with my ? It will be compatible with any device running iOS 5.1.1 except iPod 3G, iPhone 3Gs and ATV3 (right now, may change in a near future, nobody knows). Why is it so slow to release now that the iPad 3,1 has been demoed ? There are 16 different devices out there to work on and to test. It takes time. May I be a beta tester ? No, sorry. 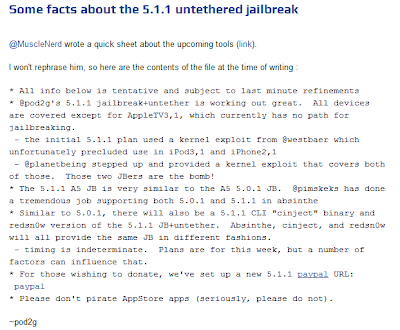 Only really trusted people (that can be counted on one hand) could have access to the jailbreak. I don't want any leak to happen. What if I offer you 1,000,000$ ? Be patient, it's gonna happen.